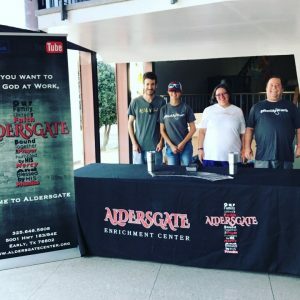 Aldersgate Enrichment Center is a non-profit organization in Early, TX that is dedicated to enriching the lives of adults with special needs. We stand firm as an independently-funded, non-denominational organization with strong religious values. Our two main areas of focus are our vocational programs and our residential programs; however, our ministry reaches far beyond those two areas really focusing on the individual as a whole and ensuring that each associate is striving to reach new goals and enjoy life at new levels. Our mission is to establish and maintain an innovative religious community that provides opportunity in all aspects of life for adult persons with special needs, regardless of race or religion. We are building a new transitional living complex for individuals with disabilities and we were in need of furnishings to make this place a home. Many of these individuals end up homeless or in domestic violence shelters as a result of inadequate housing with ongoing support for their disabilities. Thanks to this donation of high-end mattresses we will be able to furnish our new apartments as well as to replace used bedding in our assisted living facilities. One 23-year-old young man moderately functions due to severe violence inflicted upon him by a parent when he was a child. He can’t live at home but has failed at living independently due to lack of structure and support. Due to the trauma that he experienced as a child, he has bounced from subsidized housing to complex living arrangements and finally moved into our center. This was a temporary move, so the length of his stay is unpredictable, but for the first time he is starting to learn how to get by with the hand he has been dealt. Although his next move is not guaranteed, he is appreciative to have a comfortable, high-quality bed to give him a good sleep at night. Thank you Good360 for helping our residents sleep better throughout the night.